Small, localised flurries of snow may be a regular occurrence during cold Martian nights, according to new research. Michael Lucy reports. 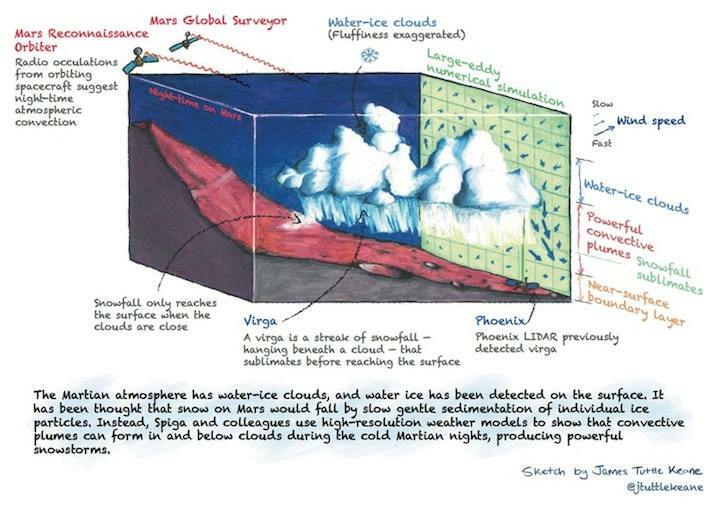 Sketch showing the processes of Martian snowfall. Though the fledgling science of Martian weather forecasting is even less precise than its terrestrial counterpart, a new study shows that night-time outlooks can include flurries of snow. It was already known that the thin, cold atmosphere of Mars allows wispy clouds of water ice to form, even though – compared to Earth – there is very little water vapour available. Until now, however, the small community of exometeorologists had believed that any snow falling from such clouds would have been in the form of dispersed particles that settled slowly downwards. According to Aymeric Spiga of the Pierre and Marie Curie University in Paris (UPMC), this is not the case. With colleagues, Spiga created an atmospheric model to simulate the weather on Mars that shows how cooling of ice particles within clouds overnight can trigger a cascade of instabilities that leads to a rapidly falling plume of snow. These storms only form at night, when the atmosphere is cold enough, and create strong mixing in the atmosphere which can in some cases result in snowfall on the surface. The process is still hypothetical, but it would explain certain precipitation signatures observed by NASA’s Phoenix lander that had been a mystery. The sudden, localised snowstorms, the authors say, may be much like “microburst” storms here on Earth, in which a region of cold, dense air carrying snow or rain drops rapidly from a cloud.